Color laser printers used to be big, slow, complicated beasts that were difficult to set up and often slow to operate. They're still big, complicated beasts that can be difficult to set up, but today's color lasers are faster than their predecessors and do a much better job of rendering color images. We took a look at seven color workgroup laser printers ranging from the relatively inexpensive $1,929 Lexmark Optra C710 to the $5,549 Hewlett-Packard Color LaserJet 8550N. Though there are differences from printer to printer, all the models in our roundup produced good results - you really can't go wrong with any of them. 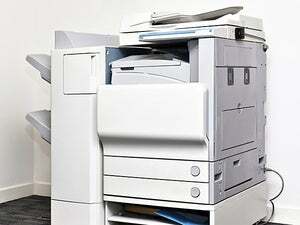 Color laser printers have always required far more setup time than monochrome printers. Among the models we tested, the only exception was the Xerox Tektronix Phaser 850DP; because it uses preinstalled solid-ink sticks rather than toner, there's little more to do than plug it in. Fortunately, each printer comes with thorough, easy-to-follow instructions that make the process almost painless. Most of the models can print at either 600 or 1,200 dpi. The exceptions are the Hewlett-Packard, which can't print at 1,200 dpi, and the Brother HL-2400CeN, which prints at either 600 or 2,400 dpi (though we needed to add another 128MB of RAM to print our Adobe Photoshop image at the higher resolution). Paper handling is much improved over previous generations of color lasers: with easy-access trays and simple icons, these printers make it a snap to load paper and clear jams. The pricey Hewlett-Packard offers the beefiest workgroup support, with an 1,100-sheet paper tray and a 3.2GB internal hard drive. Other than Minolta's magicolor 2200EN, with its 500-sheet tray, the rest have typical 200- to 250-sheet trays. But the top concerns with workgroup printers are connectivity and speed. All the printers except the NEC SuperScript 4650N support 100BaseT, and all are fast: most clocked in at a respectable 16 text pages per minute, although the Hewlett-Packard had the edge at 24 ppm. When we printed at 1,200 dpi, most of the printers were able to maintain their speed. The Tektronix Phaser 850DP, however, took four times longer to print at the higher resolution than at the lower. All seven printers we jury-tested did a good job of producing smooth text. At the toner-saving resolution of 600 dpi, most produced perfectly acceptable results, although text was a bit more jagged and overall contrast was lower. Only the Minolta's 600-dpi results were excellent, with sharpness rivaling that of 1,200-dpi output. At 1,200 dpi, output was excellent from all but the Tektronix Phaser 850DP. And as you would expect, pages from the Brother's super-high 2,400-dpi resolution looked superb, though not phenomenally better than those of the top-testing 1,200-dpi units. If you've ever printed images on a high-quality color ink-jet printer, odds are you'll be disappointed with color-laser output. With their slightly dull tone, frequent dynamic-range trouble, and occasional artifacts, images printed on color lasers are simply inferior. But the machines do speedily produce prints that are durable and cost-effective, and their image quality is generally good enough for most business applications. In our Photoshop test, only one printer received an excellent score: the 600-dpi-only Hewlett-Packard. Its images had the best dynamic range, contrast, and detail, although the output still wasn't as good as that of a cheap ink-jet. The models capable of printing at 1,200 dpi earned "acceptable" ratings, at best. They tended to produce lackluster, often muddy images. The Lexmark fared worst in this category, producing a rather noisy, flat image. Most models did a fine job of printing a Microsoft Excel 98 graph. Only the NEC (at 1,200 dpi) and Minolta (at 600 dpi) rated "poor" - the former for its low contrast and the latter for its slight graininess. Macworld's Buying advice: If you're shopping for a color laser printer, you probably need a fast model that can handle a lot of throughput rather than one with exceptional image quality. In that regard, the Hewlett-Packard Color LaserJet 8550N is far sturdier than the competition and delivers good quality. Unfortunately, it's also far more expensive than its rivals. The Xerox Tektronix Phaser 750DP alone produced good output under all conditions, but it too is rather pricey. With a price in the lower range as well as overall good quality, the NEC SuperScript 4650N emerges as the winner. Although it lacks support for 100BaseT networking and fared poorly on one graphics test, its speed, capacity, and quality make it a solid performer at a very reasonable price.